83 percent of respondents agreed or agreed strongly that access to the Internet should be considered a basic human right. More than 2/3 agreed or agreed strongly that increased government control would inhibit the growth of the Internet and/or stifle innovation. 19 percent of respondents were aware of circumstances in which personal data was used in a way they did not expect. The most commonly reported consequences were: unsolicited communications, stolen personal data, private data becoming public, impersonation, and financial loss. 98 percent of users agreed or strongly agreed the Internet is essential for their access to knowledge and education. 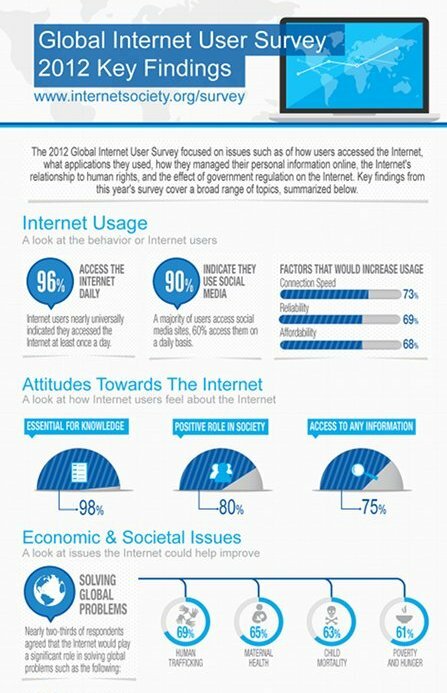 Please find a Summary on the Internet Society Webpages on the Global Internet User Survey. The get a better picture on the Internet User Survey feel free to download the Info-Graphik.